Few cars have the bragging rights to say they’ve celebrated a 50th birthday, and there arguably is not another car as tied to the American culture as the Mustang. The Mustang is a car beloved by people from all walks of life and is affordable enough for many to own. Over recent years, times have changed and new car sales may have dipped, but the Mustang’s popularity sure hasn’t. Want evidence? 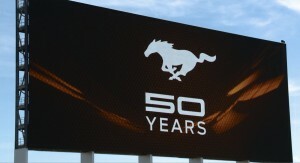 Check out the recap of the Mustang’s 50th Birthday in Concord, North Carolina. Over 6,000 Mustangs attended the event between Wednesday and Sunday, drawing in over 100,000 people according to the Mustang Club Of America–the group in charge of hosting the event. Ford was heavily involved as well, debuting the 2015 Limited Edition Anniversary Mustang and showcasing a black 2015 5.0L GT. Sadly, Ford still has yet to reveal the horsepower and torque figures. Mustangs Across America also held another cruise to Charlotte Motor Speedway, spanning from Los Angeles, CA to the 50th celebration in North Carolina. 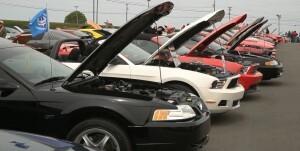 In all over 500 Mustangs participated in the 7 day long cruise that spanned more than 2,500 miles. There was no way to overshadow the significance or size of the cruise, but even at 500+ Mustangs, it was only a portion of the thousands of both classic and modern Mustangs in attendance. A ripe mix of both historically original and completely modified cars graced the show. Even a lone convertible Camaro tried to get in on the action, but was promptly towed. There were Super Snakes, 2015 Mustangs and Ford even trailered out the first Mustang ever built. Dave was also able to snag an interview with Bill Ford and ask him about the 2015 Mustang. Saturday the weather was not nearly as cooperative as everyone had hoped, but that did not stop Vaughn Gittin Jr and Ryan Tuerck from putting on one hell of a show. Whipping around in tandem at speeds exceeding 100MPH, the drift kings took the rain as an opportunity to showcase the amazing skill and precision that goes into drifting. Refusing to be limited by the weather, they kept the crowds entertained and turned around a day that many thought would be a wash.
MMD surprised everyone by revealing that they were giving away Project MMD to one lucky at the 2014 AmericanMuscle Car Show on August 16th. Signups were open to everyone throughout the event and extend until August 4th. The 2014 Oxford While GT with a matte while plastidip was Muscle Mustangs & Fast Fords May 2014 Cover Car as well as a featured car in Forgestar’s SEMA booth. Whoever wins will be driving MMD’s 2014 GT with over $30,000 in modifications home from the AM car show this August. Charlotte Motor Speedway also featured Open Track Time for both amateurs and experienced racers willing to pay the $250 daily racing fee plus the one-time $50 registration fee. This gave onlookers a constant source of entertainment throughout the show and provided the opportunity for novice motorists to experience what it’s like to race on a track usually populated by professional racers. In all, the show was one spectacular display put on by Ford, The Mustang Club of America (MCA) and Mustangs Across America that culminated in a Guinness World Record breaking cruise, the 50th Anniversary Mustang & 2015 GT being showcased, 100,000+ spectators and over 6,000 Mustangs all in one place. Let’s not forget about the awesome drifting put on by Gittin and Teurek as well as MMD’s Mustang giveaway. Needless to say, it’s probably going to take some creative thinking on the part of Ford and MCA to top this birthday celebration the next time around. A nice sculpture about Ford Mustang 1965! Hope you enjoy it!